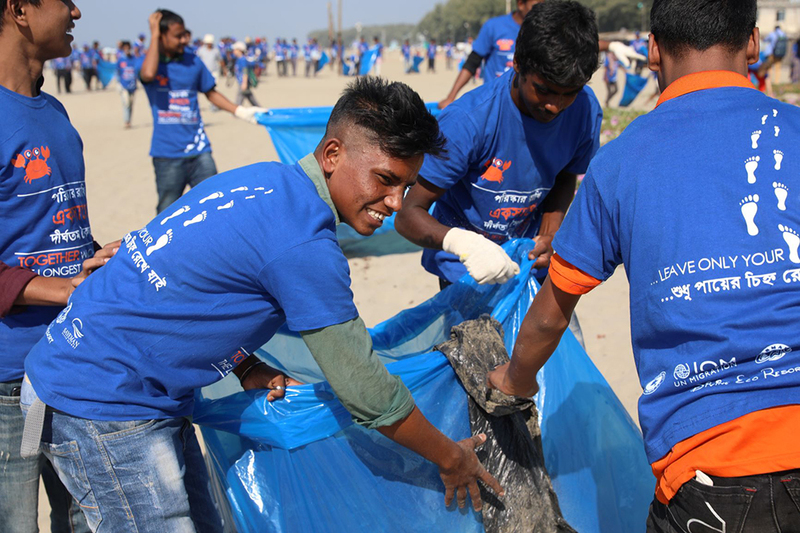 Cox’s Bazar – The ‘world’s longest beach’ got a winter clean this weekend, when hundreds of UN staff, local volunteers and district authority representatives took to the sands in Cox’s Bazar, Bangladesh, to pick up rubbish, in an event sponsored by IOM. Cox’s Bazar district became the centre of the world’s fastest growing refugee crisis last year when over half a million Rohingya refugees fled across the border with Myanmar in just a few weeks. Almost a million refugees now live in camps outside the main town – in what has become the world’s biggest refugee settlement. But the area – long considered one of Bangladesh’s top tourist destinations – is also an important wildlife habitat. Sections of the 120km-long stretch of beach, often hailed as the longest unbroken sea beach in the world, are important breeding ground for turtles. The weekend cleanup was organized by staff from IOM and other UN organizations who volunteered their time and encouraged others to come and remove plastic and other rubbish from the beach, and to raise the awareness of the environmental damage it causes. Two of the key organizers, Carlos Fayolle and Miriam Klinkenberg said they were amazed and delighted by the turnout, after over 300 people – of all different ages and backgrounds – turned up to take part and collect dozens of bags of rubbish, despite the intense heat. The success of the event means similar initiatives are expected to take place in the New Year. IOM Emergency Coordinator Manuel Pereira said the Organization was very pleased to support the event. “IOM and our local and international partners are committed to working together with the Bangladesh authorities to redress the environmental impact of the refugee crisis on Cox’s Bazar. It’s inspiring to see so many people give up their free time and come together for this important event to support environmental protection and raise awareness,” he said. Syful Asrab, Assistant Director with the Department of Environment in Cox’s Bazar, who took part in the event, noted that the beach has been declared “an ecologically critical area” and now hosts several important environmental projects, including turtle hatcheries. He praised the commitment shown by the volunteers and said that more support would always be welcome, due to the limited resources available to protect such a large area. S.M. Sarwar Kamal, Additional Deputy Commissioner for Tourism in Cox’s Bazar, who also took part, said around 30 local women were employed to help clean the beach, but Cox’s Bazar had never seen a beach clean on the scale of this weekend’s event. He added he hoped it would also raise awareness among tourists about the damage caused by littering. While the beach clean-up was a voluntary event, IOM and other UN organizations are working on a wide range of official projects to help the Bangladesh authorities to address the environmental impact of the refugee crisis. The arrival of so many people in such a short period of time, led to the destruction of vast swathes of forest by people desperate for land to build their shelters. Further large-scale deforestation has continued due to the need for firewood. Under the joint Safe Plus initiative, IOM, the UN Food and Agricultural Organization (FAO) and the World Food Programme (WFP) are planting tens of thousands of trees and supporting alternative fuel projects for refugees and members of the local community in Cox’s Bazar to help redress deforestation.